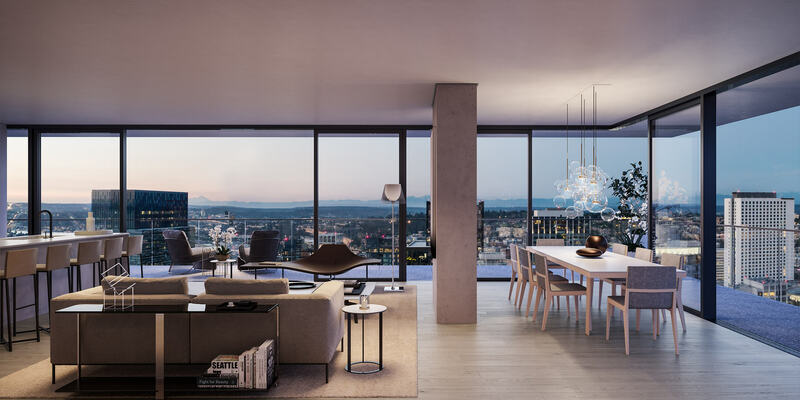 Bringing you a collection of the finest residences Seattle has to offer, First Light is bound to be one of the finest in the city. 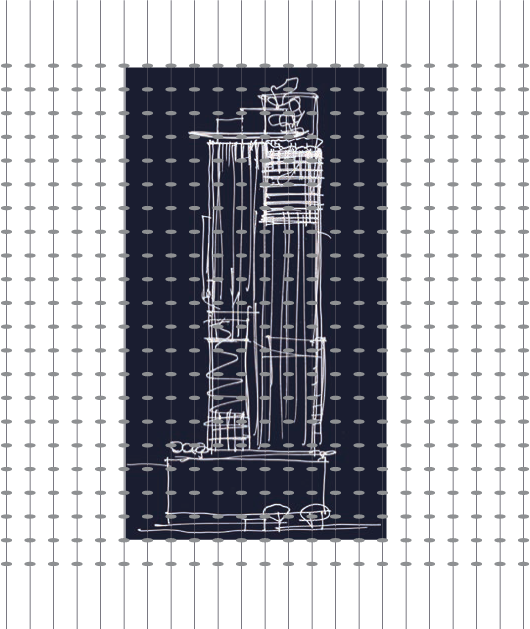 Great consideration went into the retail spaces at the ground level, topped by 6 floors of high offices. 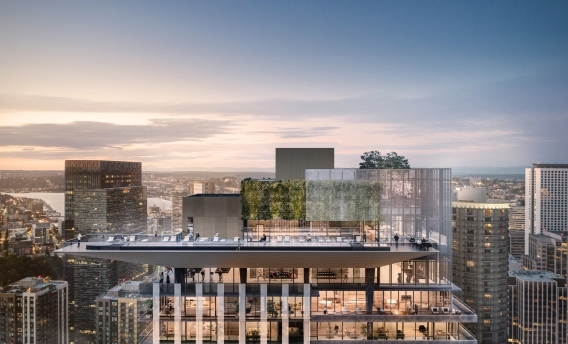 These work spaces are elevated on a platform for those who are scenery-oriented, perched between South Lake Union and downtown. Above the offices are 26 floors of condos, showcasing stunning views of the harbor and mountains. 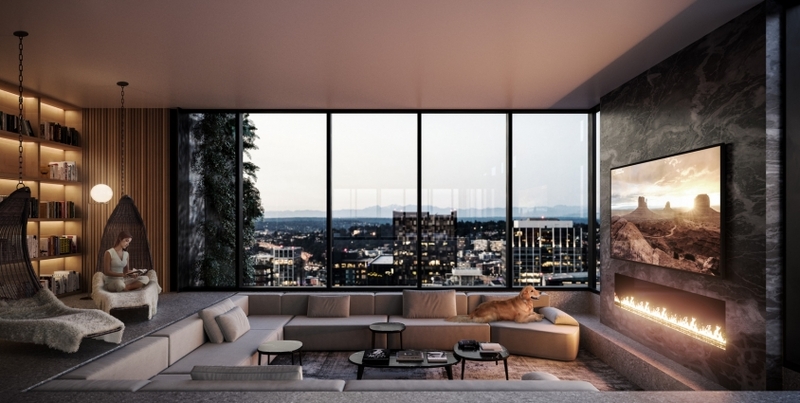 First Light was designed to beautifully coexist and blend the natural, city landscape of Seattle with luxurious modern living. JKMCA has long believed that roofscapes need not end in a flat plane nor the volutes and pediments of antique furniture. First Light's lap pool is cantilevered, providing a dramatic horizontal cap in contrast to the floors below, emphasizing verticality. The building’s rooftop will be like the vibrant roofs in the historical buildings of Athens and Istanbul. light and urban living, a high ratio of apartments will have views of Puget Sound and downtown’s dynamic landscape of towers. An interior “skylight” is also featured at the residential Bike Clubhouse – a glass ceiling running the length of the room and looking up to the lobby installation by glass artist John Hogan. 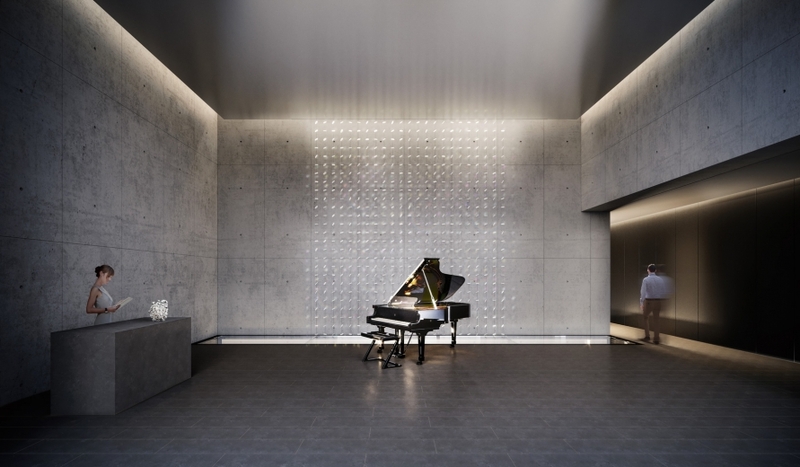 Crafted by renowned designers and architects, spaces and amenities at First Light ensure the maximal level of comfort, convenience of travel, and harmony and wellness within the residential community. The First Light residential entrance and lobby will be a gallery with the convenience of a 24/7 concierge. First Light will offer not only parking, but also a residents-only luxury car-share program. The First Light Bike Clubhouse is designed to create a comfortable place to tune your bike, including a bike wash. 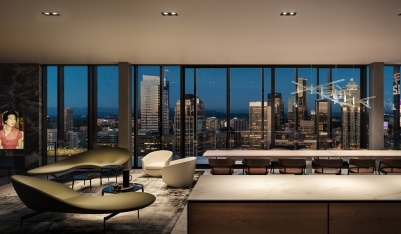 The refined and spacious 47th-floor Residents’ Salon is perfectly equipped for gatherings, and boasts one of the best views in Seattle. The design philosophy frames brilliant views with a rich palette of earthy tones with fine custom furnishings. This sophisticated gathering space will be the perfect place for events and meetings for special occasions. 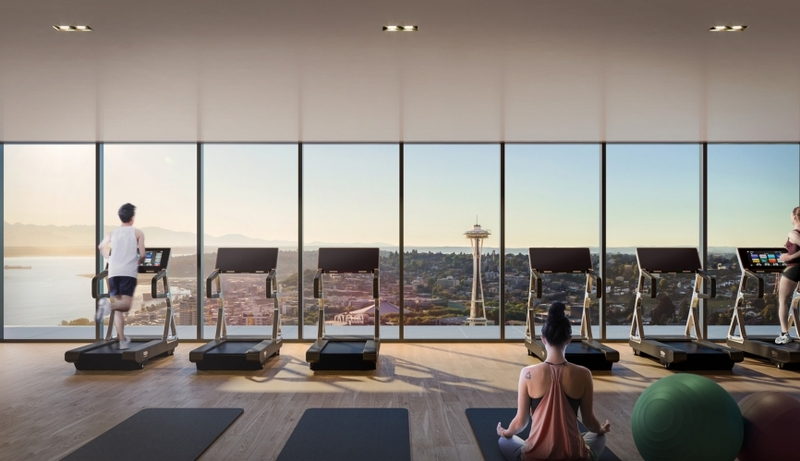 Perched on the 46th floor, the First Light Wellness Center will be one of the most beautiful places in the Pacific Northwest. 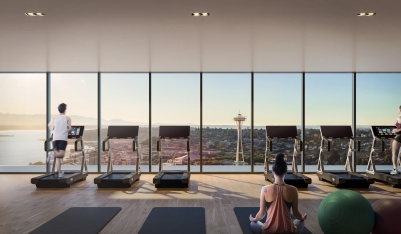 Two stories of amenities open to every resident, the gully-equipped cardio room has access out onto a landscaped, wrap-around terrace, as well as a weight room and a yoga and stretch room. 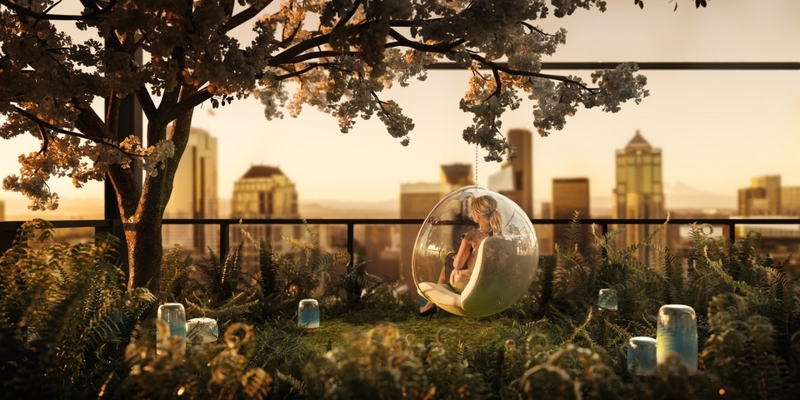 The Apple Orchard will be a vibrant pop of nature in the middle of the city: a bountiful orchard, gently shaded refuge, and a place to breathe in the fragrant air. The Pacific Northwest is famous for its verdant rainforests and natural splendor, one of the most fertile biospheres on earth. The Orchard will provide a place to enjoy all seasons. 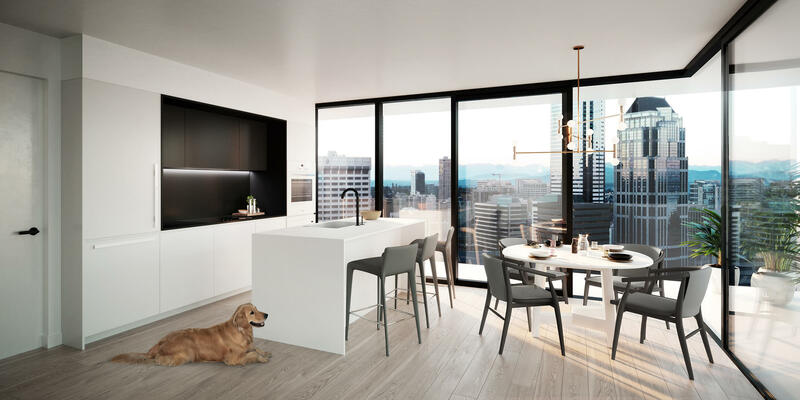 Delivering only the most effortlessly sleek and high-quality designs, First Light living spaces feature top-quality appliances to elegantly designed rooms and spaces. Each home at First Light is themed by a natural palette, supplemented with contrasting design details. Floor-to-ceiling, triple-paned windows allow residents to enjoy spectacular views, with the mountains of the Olympic Peninsula glinting in the distance. With a sliding door to your balcony, you have the fresh breezes drifting in off of Puget Sound. 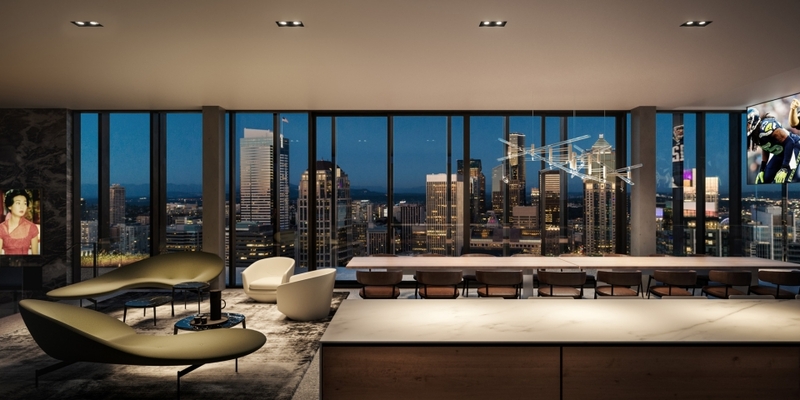 First Light kitchens and ensuites will be built around cabinetry that James KM Cheng Architects designed in collaboration with a custom mill-work manufacturer from Italy, supplied by B&B Italia, the contract division of the renowned international furniture and design house. Every home boasts top-quality Kohler fixtures and Miele appliances that seamlessly flow into the design of a modern space. 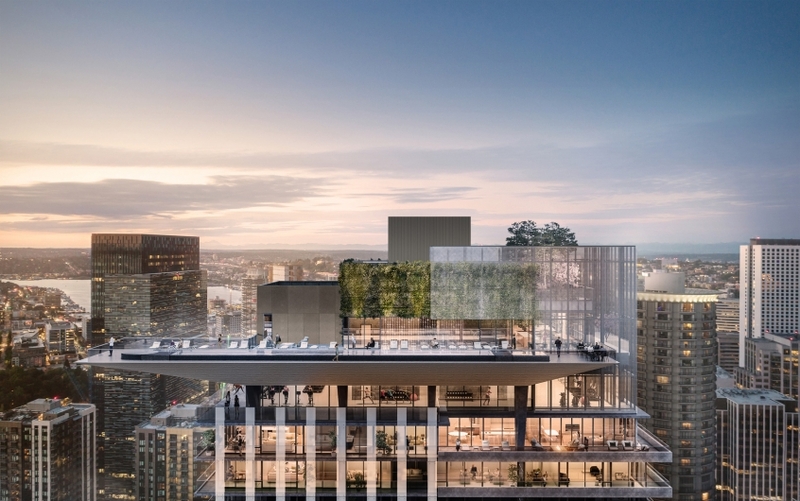 The First Light Penthouses feature expansive 45th-floor corner suite living areas with full, floor-to-ceiling windows, maximizing views and presenting ease of access to the wrap-around balconies. All Penthouses have three bedrooms, each with an ensuite, plus a powder room for guests. Kitchens have an expanded Miele appliance package (including a wine fridge and espresso machine) and a custom chandelier by John Hogan and Bec Brittain. With a keen commitment on every meticulous detail, enjoy a space that is effortlessly elegant and functional. Prepare to indulge in a unique and luxurious living experience unlike no other - this amazing opportunity awaits you. Surrounded by water, mountains and evergreen forests and some of the world’s renowned technology companies, Seattle offers the best of both the bustling city life and natural scenes. As one of the world’s crucial technology centres, Seattle continues to be the fastest-growing city in the United States. Offering one of the top education systems globally, this city proves to be a promising home for aspiring talents and those looking to make their mark in the high tech industry. As the headquarters city for some of the top companies in the world, including Boeing, Microsoft, Amazon and Starbucks, Seattle is the global center that excites and inspires. A true platform for the passionate innovators. Proximity to the great outdoors in every direction, this city offers a delightful and moderate climate all year round. As a central hub for culture and entertainment, Seattle offers a vibrant environment and lifestyle for all. Copyright © 2019 Virani All rights reserved. Virani Real Estate Advisors is not a direct representative of Westbank Corp. Westbank Corp is not liable for any modification or misrepresentation of the product offering.